Birth Date: April 7, 2016 PMY 143D Red SSS N.K. 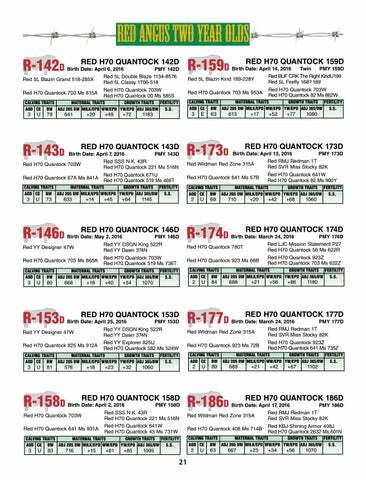 43R Red H70 Quantock 703W Red H70 Quantock 221 Ms 516N Red H70 Quantock 671U Red H70 Quantock 67A Ms 841A Red H70 Quantock 519 Ms 466T calving traits	maternal traits	growth traits	Fertility aod	ce	bw	adj 205 Dw	Milk/epd	ww/EPD	yw/epd	ADJ 365/Dw	S.S. Birth Date: April 13, 2016 PMY 173D Red RMJ Redman 1T Red Wildman Red Zone 315A Red SVR Miss Stocky 82K Red H70 Quantock 641W Red H70 Quantock 641 Ms 57B Red H70 Quantock 82 Ms 900Y calving traits	maternal traits	growth traits	Fertility aod	ce	bw	adj 205 Dw	Milk/epd	ww/EPD	yw/epd	ADJ 365/Dw	S.S.